In the second Columbian College of Arts and Sciences ceremony, speakers implored students to become self-aware, global citizens worthy of creating and challenging public policy. 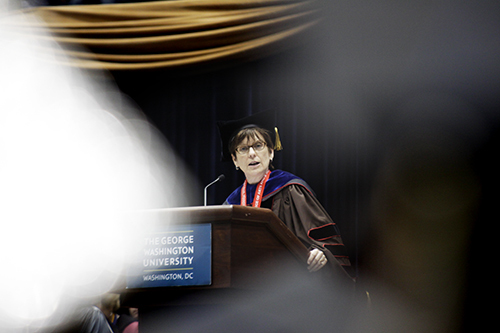 She acknowledged that while the term “global citizen is very GW,” it evokes a sense of curiosity, political savvy and social awareness that all people – not just GW graduates – should have. In a shrinking, connected and contentious world, McAlister said, students have no reason to ignore the complex. McAlister asked graduates to challenge social norms, recalling the vastly different personalities of two former students. The first, Chrissi, was an outspoken, multilingual Egyptian woman who later worked for the U.S. State Department. Meanwhile, Chrissi’s best friend, Michael, was a “moderate white boy from Jersey” who “had maybe been to London,” McAlister said. She said though Michael and Chrissi shared different cultural experiences, Michael was willing to compromise and collaborate, which allowed him to grapple with tough social questions during his time as an investment officer at Google. “It’s not about being either liberal or conservative when you make policy your business. Engage in moral issues you care about. I urge you to make the world your country,” McAlister said. Alexandra Kralick, a biological anthropology major who spent time in Rwanda for an independently funded research project, spoke as the distinguished student scholar. She told graduates to consider their ecological footprint and desire to consume, citing “trendy fashions” and new technologies like iPhones as some of the leading causes of deforestation and mineral mining that perpetuates armed conflicts.